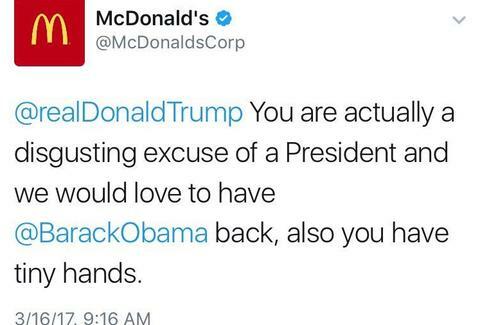 The president of the United States -- prone to tweeting unpredictable diatribes in his own right -- got served a healthy dose of Twitter shade by none-other than McDonald’s on Thursday morning. In a tweet that’s since been deleted, the company’s corporate account was unrelenting in its disdain for Donald Trump and happy to praise former president Barack Obama. When the tweet went live it sparked a whirlwind on the internet, because why the hell would a global burger chain be immersing itself in politics? The tweet was pinned to the top of McDonald’s account for all of 20 minutes before getting deleted. Still, it suggested that McDonald’s is not pleased when it comes to Trump’s “tiny hands” and his affinity for burnt, ketchup steaks. McDonald’s tweeted shortly afterward that its account had been compromised. An investigation is underway -- which means the Hamburglar is likely seeking refuge. As for how the account was potentially breached, some theories are surfacing.